It's no secret that I travel extensively, at least once a month - except for June which was a glorious month home with no required travel, and February, when I got so sick I had to cancel several trips. However, this month, husband has traveled to Texas with Charlotte so I guess we are keeping status quo with our trips. I've always wondered what it's like to be left home with the kids while the other parent does fun things like eat out at restaurants and has NO chores! Seriously, what chores can one possibly do while traveling except for maybe bills? So the traveling parent gets off scott free while the one at home slaves over twice as many chores as normal. But this post isn't about the extensive chore load of laundry, dishes, pet care, etc; no it's about the mishaps of keeping kids happy when I'm more used to sitting behind a desk and directing product development! Yesterday, I bravely took two kids to a 50" retro pool party and family reunion in Hedgesville, WV - without GPS because my darling cousin left it in my best friends van who lives in Pittsburgh! So I used my phone, which clearly stated my next direction was to make a right hand turn so when I came to the end of the road, I went right. Apparently in WV, the 901 likes to twist and turn, so I was supposed to go left to STAY on the 901. Going right meant switching road names. So that sent us about 4 miles in the wrong direction before I looked at my phone again. I was supposed to go six so that's why I got that far without looking at the phone again! Getting lost, combined with these twisty windy roads had me in a panic like, what if the van just stopped working, there is no where to pull off! What would I do? Who do you call out in the middle of NO WHERE!?! How soon do they get there? Do you abandon the vehicle and head out to pasture until help comes? Or just wait to be smashed from behind? Because these locals drive fast while I'm poking along at 20mph. Well we finally made it, and the party was in full swing with everyone already eating. I figured the polite thing to do would be to eat first and then get in the pool so with two and three year old in tow, I got in line to fill a plate. The three year was not having this! He was promised a pool party and that means getting in the water immediately. Telling him to wait is tantamount to torture in the worst way, torture for me that is because every two seconds, "can we get in the pool now?". "No Sam, not till I'm done eating, here's some cookies and soda". That get me through half my plate before he was pestering to go again. Finally we get to the pool when I realize Violette is soaking wet. We haven't even been near the pool yet so it means her swim diaper didn't hold up. Back to the van to change Violette. Sam's nearly hysterical, we are leaving the pool! Finally we get back to the pool and note they are about to do the "Twist and Shout" dance contest. I tug on their new floating devices which are like a straight jacket for kids! Seriously they are so tight I have to tug and pull their little arms through the holes and no way that I can tell, maybe husband could figure this out if he were here - to expand the sides to make it any easier! After much tugging and pulling, I finally got them ready for the BIG POOL. Violette panics out and clings to me for dear life. Sam bounces around like a happy fish back in water also clinging to me every two seconds making it extremely hard to talk to anyone. My aunt and uncle come over to chat and while we get caught up Sam plays a game of drifting away, panic and grab for my arm to save him. Over and over and over. Finally Violette gets out and I convince Sam to go get more cookies and soda so I get a tiny break before he drags me back to the pool for more "fun"! Another relative comes over to chat and this time I've convinced Sam to float without grabbing my hand. The conversation goes well! I enjoy myself and actually lose track of time. Oh look, they are doing the family auction, that means the present for who's traveled the farthest are coming up, I always win this one. I get them out of the pool with more promises for cookies and soda. This time we sit down so they can see I'm serious about talking with relatives. Sit and be good I tell them. But the sugar, oh the lovely lovely sugar rush from eating 10 cookies in one afternoon consumes their ability to be civil. Sam begins an all out assault on my senses, it's like he's taken classes on psychological warfare because he starts begging and begging to return to the pool, until I lose all track of what I wanted to say to anyone! I tell Sam, we must leave at once. My aunt says she will help me gather my stuff and shuffle the children back to the van. But first I must get a sandwich for dinner to make up for barely eating earlier. I carefully make my way through the crowd that is still bidding on auction items, giving up all hope at staying for the gift giveaway part, get my pork pulled sandwiches from the only food section that's plugged in and not likely to give me any panic about food poisoning and make my way safely back to our stuff. Sam pulls an ultimatum, please mommy, just 5 more minutes in the pool! I'm so tired that against all logical rational, I actually give in and time him. Of course he rebels at the alarm and I must pull him out kicking and screaming. Violette runs wild and threatens to throw herself in the deep end until we catch her. We depart through the spontaneous basketball game that as suddenly taken place around our stuff. Outside the pool area, Violette escapes again, but we are in a "safe place" so we kinda let her run around parked cars as no one else is leaving. She follows us back to the van and then runs down a hill after a cat while I drop our stuff in the van. I finally catch her and begin a quick clothes change only to realize she's had a horrific diaper! I really really really hope it JUST happened in this recent run around because it pains me to think she might have sat in that water with a poopy diaper. In fact, the more I think about it, I'm positive she had to have had the diaper after the pool because she always runs around like crazy when she's having a poo. My aunt continues to chat, not realizing at all what horror is running through my head. I finally get the kids changed and hit the road. I get back on that 901 and declare it is not going to defeat me this time, but it does, in a different spot! Only this time, you need to make a surprise right hand turn to stay on 901 because if you go straight, the road name changes!! I just can't understand this, so feeling traumatized and tired of West Virgina, I just turnaround and get back to the safety of highway 81 and come home. To Celebrate Father's Day, we are going to ask dad to do everything he does on a normal day, and then some! Because he's DAD (Duty Abiding Dude), or something like that. I've never been good at making up acronyms. We started the day by not making him breakfast. At one point I whispered to Charlotte to tell her dad happy Father's day. We did not get him a card or present. In all fairness, I didn't get anything for Mother's day. We made him pack up all our beach supplies and drive us to the beach. Of course he had to carry everything and play with the kids in the water while mom lounged under the umbrella. We did however, make exactly half of dinner before getting too tired and asking him to finish it - BUT see this way everyone thinks he did all the work and he gets thanks from the kids. See? It's a gift that WE give to HIM. We love you Molder Clan DAD! Keep on giving!!! ps. Yes really, we love you!!!!! Help! I need an Elsa dress for my darling's 6th Birthday!!! "I thought we agreed that we wouldn't go ALL OUT for birthday parties", my husband dryly says to me after I text him that we have an Elsa dress crisis. Clearly he does NOT understand the magnitude of the situation. Charlotte's birthday is in ONE WEEK and I promised her a Frozen birthday party complete with Elsa dress! Frozen invitations have already been sent out!! Was there a time when I didn't have birthday fever; that rash of panic that comes with making the most memorable perfect party for my little darlings? I must have been rational once, he remembers it. The drama started a week ago when I suddenly realized that there were NO Elsa dresses in stock - anywhere! Except on Amazon where greedy sellers had purchased all the Disney Store versions and were selling them for $161.00 and UP! No way, I'm not that mother. I'll panic and fret but I will not pay that much. By miracle, I found one by The Factory Depot for only $48.00 + shipping, okay that's still more than I wanted to spend but it was the only thing available and upon placing order, they promised it by June 10th - which came and went two days ago! In a panic, I wrote to the seller only to learn it was on back order for 2-3 weeks. This is NOT Happening!!! Her birthday is on June 19th! So, I went to Ebay which inexplicably showed me all the pricing in Vietnamese - wait, what? I don't have time for this. Move onto Etsy where they have lots of cute items but they are ALL custom made to order which means they would NEVER get done in time! In a moment of absolute brilliance, and probably also due to my years of working in licensed products, I realized it's just a teal dress! 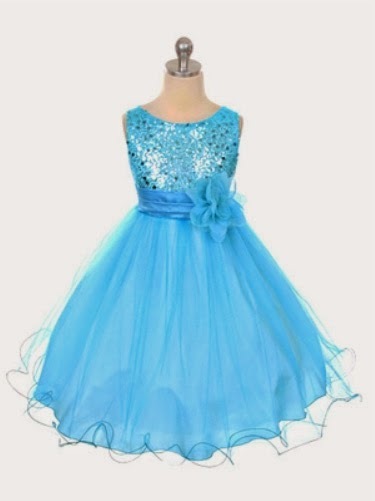 Find a party dress supplier and just buy a teal dress (thank you PinkPrincess.com (just select Flower Girl Dresses Blue)! My husband and I can add the cape with painted snowflakes and walla! Elsa Dress!! Oh, but what if the little darling realizes it's not the real Elsa dress? Have you looked at the Disney Store version, it's just as far from reality as mine will be. Little girls don't have Elsa's long slim body so the official Disney Elsa dresses are all loosely based on the movie version with more frills and pomp. Photos will be posted after the party!